This screen is accessed from the back-end Joomla! administrator panel. 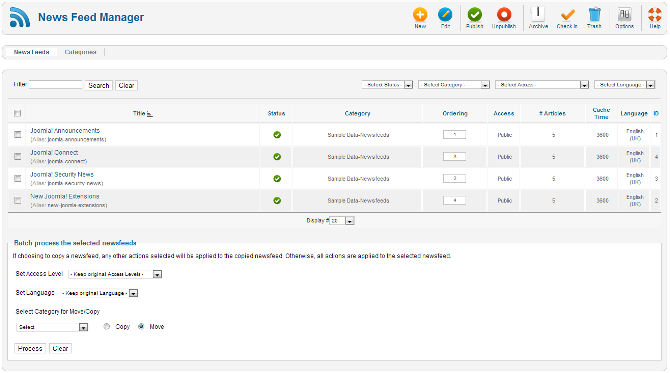 It is used to manage newsfeeds which can be displayed on your Joomla! website. Select Components → News Feeds → Feeds from the drop-down menu on the back-end of your Joomla! installation, or select the "Feeds" link from the News Feeds Manager - Categories. 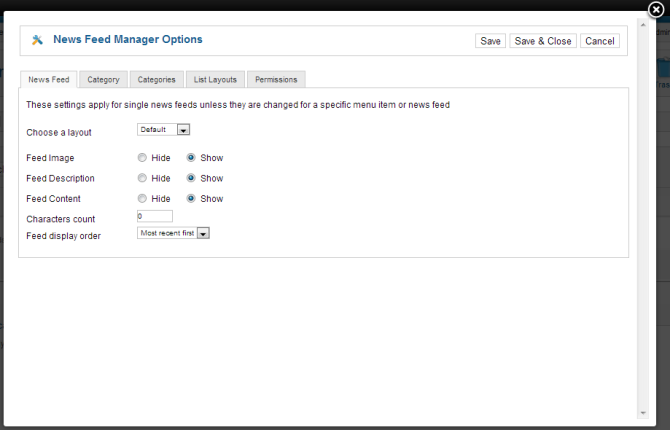 The News Feed Manager screen allows you to add News Feeds from other sites to your Joomla! site. You can add links to these feeds for users by creating News Feed layouts in Menu Item Manager - New/Edit. Title. The name or title of the feed. Make it as descriptive as possible. Category. The Category to which this News Feed belongs. See Category Manager - Edit (News Feeds). Note that News Feed Categories are separate from other Categories, such as those for Articles, Banners, Contact, and Web Links. Ordering. The order to display items. If the list is sorted by this column, you can change the order by clicking the arrows or by entering the sequential order and clicking the 'Save Order' icon. Note that the display order on a page is set in the Parameters - Advanced section for each Menu Item. If that order is set to use something other than 'Order' (for example, 'Title - Alphabetical'), then the order value in this screen will be ignored. If the Menu Item Order parameter is set to use 'Order', then the items will display on the page based on the order in this screen. Feed Count The number of articles included in the feed. Cache Time. The number of seconds for which to cache the feed locally. It can safely be left at the default. Language The language of the feed. New. Opens the editing screen to create a new news feed. Edit. Opens the editing screen for the selected news feed. If more than one news feed is selected (where applicable), only the first news feed will be opened. The editing screen can also be opened by clicking on the Title or Name of the news feed. Publish. Makes the selected news feeds available to visitors to your website. Unpublish. Makes the selected news feeds unavailable to visitors to your website. Archive. Changes the status of the selected news feeds to indicate that they are archived. Archived news feeds can be moved back to the published or unpublished state by selecting "Archived" in the Select Status filter and changing the status of the news feeds to Published or Unpublished as preferred. Check In. Checks-in the selected news feeds. Works with one or multiple news feeds selected. Trash. Changes the status of the selected news feeds to indicate that they are trashed. Trashed news feeds can still be recovered by selecting "Trashed" in the Select Status filter and changing the status of the news feeds to Published or Unpublished as preferred. To permanently delete trashed news feeds, select "Trashed" in the Select Status filter, select the news feeds to be permanently deleted, then click the Empty Trash toolbar icon. Click on the Options button to open the News Feed Manager Options window. This window allows you to set default parameters for News Feeds, as shown below. Save. Saves the newsfeed options and stays in the current screen. Save & Close. Saves the newsfeed options and closes the current screen. Feed Layout: Allows users to set the specific content layout for newsfeed items. Feed Image. Hide or Show the image of the News Feed. Feed Description. Hide or Show the description text of the News Feed. Feed Content: Allows the user to show or hide the content in the newsfeed. Characters Count: Allows users to define how many text characters are shown. Choose a Layout: Allows users to set the default content item layout for newsfeed articles. Category Title: Can Show or Hide the Category Title for the newsfeed items. Category Description: Can Show or Hide the Category Description for newsfeed items. Category Image: Can Show or Hide the Category Image for the newsfeed items. Subcategory Levels: Can set how many sub-category levels will be displayed in the newsfeed. Empty Categories: Can Show or Hide empty categories (categories with no active articles in them). Subcategories Descriptions: Can Show or Hide the Description for Subcategories in the newsfeed. # of Feeds in Category: Can Show or Hide the number of categories in the newsfeed. NOTE:These options can be modified on a per-menu-item basis. Top Level Category Desctription: Can Show or Hide the description for the top level category shown in the newsfeed. This may be changed in the menu item configuration window for specific menu items. Subcategory Levels: Can determine how many subcategory levels to display. 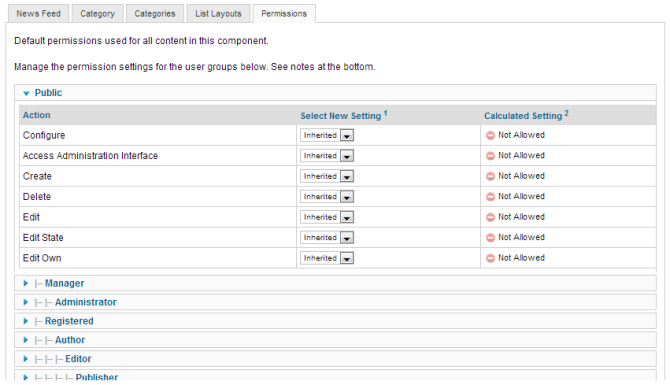 Subcategories Descriptions: Can Show or Hide Subcategory Descriptions. # of Feeds in Category: Can show or Hide the number of newsfeeds in each category. NOTE: These options may be changed on a per-menu-item basis. # Articles: Can Show or Hide the number of articles in each newsfeed. Feed Links: Can Show or Hide a link to each feed. Change an newsfeeds state (Publish, Unpublish, Archive, and Trash) in the component. Edit existing newsfeeds in the component that the logged in user has created. You can filter the list of items either by typing part of the title or the ID number. If you have a large number of items on the list, you can use this filter to find the desired item(s) quickly. Enter either part of the title or an ID number and press 'Search' to display the matching items. You can type whole words or part of a word. For example, "ooml" will match all titles with the word "Joomla!" in them. You need to add at least one Category for news feeds before you add the first feed. Categories are added using the Category Manager by clicking on 'News Feeds', and then on 'Categories' in the 'Components' menu. This page was last modified on 9 April 2013, at 18:29.